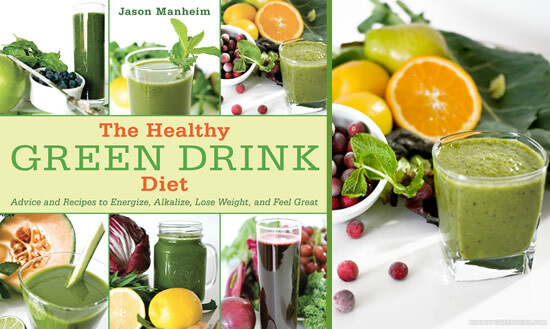 The Healthy Green Drink Diet was written by Jason Manheim, a website designer and health enthusiast. He started experimenting with green drinks six years ago and has felt great ever since he began. His book outlines the health benefits of adding a green drink to your day. It also includes a selection of recipes for different variations of green smoothies and juices. The Healthy Green Drink Diet is not just for vegetarians, vegans, raw foodists or Paleo eaters says Manheim. No matter what your current way of eating, everyone can benefit by adding green drinks into their daily diet. Manaheim believes that adding good foods is a more efficient way to reach your goals than taking away bad foods. You can think of green drinks more like a supplement to the diet you already enjoy. By including green drinks in your daily routine you will gradually let go of bad habits and improve your health. Consume at least one green drink a day, preferably before a meal. If you want to take it further it is up to you. Ideally you can work up to two or three green drinks each day before your main meals. All of these compounds support optimal health and help to protect you from disease. Consuming green drinks can improve your resistance against heart disease, cancer, high blood pressure, headaches, insomnia, and irritable bowel syndrome. The color of leafy greens comes from the phytochemical chlorophyll. This substance has been shown to have beneficial effects on the immune system and fights the bacteria that contribute to bad breath and body odor. The Healthy Green Drink Diet believes greens help regulate your blood to a healthier alkaline – as opposed to acidic – state. Disease occurs more readily in a body that is mostly acidic, so eating more alkaline foods improves your health. When your body is in an alkaline state it is also more efficient at distributing and metabolizing fat. Arugula, kale, spinach, lettuce, basil, radicchio, mint, parsley, Swiss chard, dandelion greens, sprouts, collard greens, beets, pumpkin, lemon, lime, apple, radish, carrot, peach, strawberry, melon, cranberry, pear, avocado, aloe vera, spirulina, bee pollen, chia seeds, maca, goji berries, turmeric, ginger. The Healthy Green Drink Diet: Advice and Recipes to Energize, Alkalize, Lose Weight, and Feel Great retails at $16.95. It may also be necessary to purchase a high powered blender and/or professional juicer. The Healthy Green Drink Diet encourages increased consumption of fresh fruits and leafy green vegetables. Higher intake of fiber can improve health conditions including digestive disorders, diabetes and cardiovascular disease. Allows dieters to eat healthier without requiring a dramatic change in eating habits. Can be used in conjunction with your preferred way of eating. Contains color photographs, which is helpful for those who are unfamiliar with many leafy greens. Includes recipes for green smoothies and juices. Individuals with thyroid disease need to avoid certain greens – including kale – which can have a negative effect on thyroid function. Those on blood thinning medications such as warfarin must seek medical advice before consuming greens. Many of the recipes may not be palatable for people who are new to green drinks. The Healthy Green Drink Diet doesn’t provide nutritional information for the recipes. Is not a complete diet or weight loss plan. The Healthy Green Drink Diet can help you incorporate green drinks into your daily routine. This book provides information on the benefits of green drinks and a selection of recipes for green smoothies and juices. It is not a complete diet in itself but can be used in conjunction with any eating plan of your choice. The Healthy Green Drink Diet will cause readers to increase their vegetable consumption, which can improve overall health and wellness.